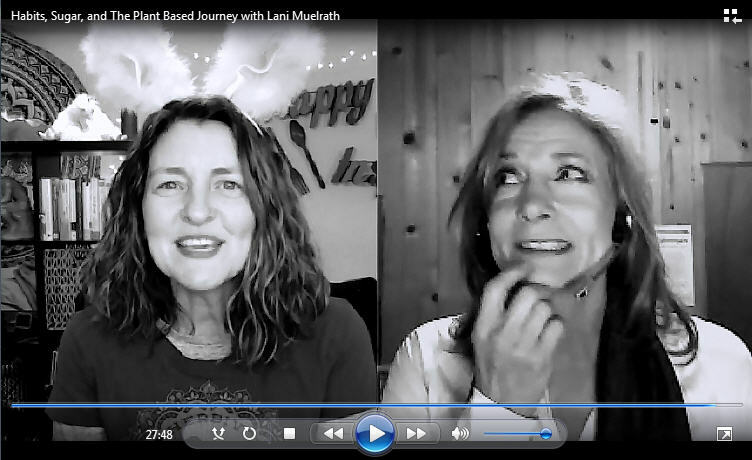 In this energetically fun and informative show, I am the honored guest of the effervescent Jill McKeever of Simple Daily Recipes. 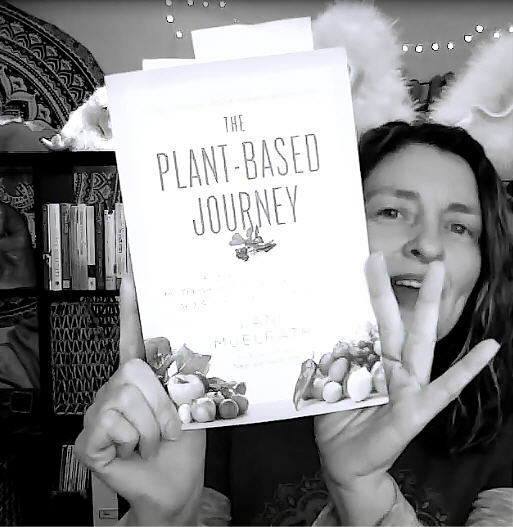 Jill starts by sharing her favorite things about The Plant-Based Journey. For more about these steps in an instance download, grab your free download of Four Steps to Halt Creeping Weight Gain and Feel Better in Your Clothes Today. Does sugar have a place in a whole foods plant-based diet? Are we all hopeless sugar addicts, or is there another way? Skype interviews don’t get any more fun than this! Jill and I would find it hard to run out of things to talk about. You may recall Jill from my recent demonstration of her Beefless Beef Stew on the “Meaty Vegan Eats” segment on Plant-Based Journey TV on CBS. Lots more video recipes from Jill on her Simple Daily Recipes YouTube Channel. Great video! 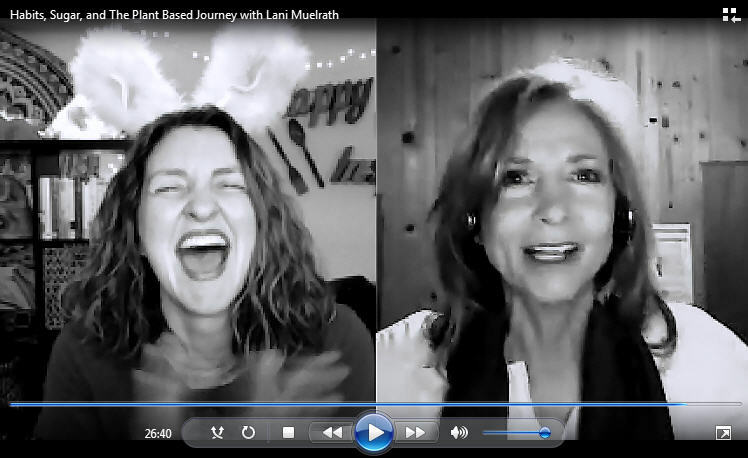 I love Jill’s videos and am SO happy that she had you on as guest Lani! Hope you two will do this again! Hi Christine! Isn’t Jill a riot? And so full of good info and recipes! Keep watching because Jill and I had so much fun we’ve vowed to do it again! Thanks for your comments! I hadn’t heard of simple daily recipes and Jill before and am glad for the extra resource. I love the way you are so supportive of others in the health world Lani! Like your comments about sugar, too. Beth, happy to bring a new resource your way and the way I see it is that we’re all in this together! Thanks for stopping to share Beth, it means a lot to me! Great interview. Loved Jill recommendation of the “Productive” App. I already downloaded it and it’s awesome! Just started walking plan this week, so timing was great. Cindy, boo on your book loss! But cheers on your attitude – maybe she is in someone else’s hands and making great strides! Where were you – what chapter or section? I hope you snap up another copy pronto so that you can keep the momentum going! So happy to have your company! You guys are way to cute!!!! Your insights about your new and ever evolving way of life/learning/learning/learning…and enjoying the wonders all around us/God’s great creation/so much to marvel at and enjoy; and enjoy this great vessel that He has entrusted to us/expecting us to take care of it as well He would Himself. Nature/Nurture – So much plant based goodness – that has been given to us…not monocrops et.al. No counting/No sweating the numbers/just fill to near satiety with fibers. Like Jack LaLanne said: If Man made it/don’t eat it!!!!! Look forward to diggin deeper in to your book too. David, thank you for your very positive and edifying reflections about all of it, and life. And glad you enjoy the video! Jill and I have plans to do some more. You’re right, way too much fun!